Historical Fun: The Life of John Ellis, Casual Labourer, Hairdresser, and Executioner. The Life of John Ellis, Casual Labourer, Hairdresser, and Executioner. On This Day in History in 1874, John Ellis was born. Nope, you probably don't recognise his name. John Ellis was an Englishman who worked as a casual labourer and as a factory worker in and around Manchester, England. He also became a hairdresser and then opened a newsagent's shop. He then had enough of the normal life and became an executioner. John Ellis executed Hawley Harvey Crippen, amongst others, who was better known as Dr. Crippen. It was one particular execution that caused John Ellis sleepless nights, though. The execution of Edith Thompson. Edith Thompson had been tried and found guilty of the murder of her husband. And then sentenced to death by hanging. Edith Thompson's execution didn't go smoothly. She collapsed before the noose could be slipped around her neck. 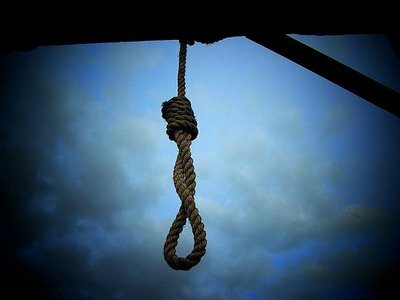 Reports state she was carried up the stairs to the gallows, tied to a wooden chair, the noose drawn over her neck, and finally hanged. That was not the unusual part of the execution. Do not read on if you are of a sensitive nature. The gallows trapdoor opened, Thompson fell through and the sudden jolt snapped her neck. It also caused a massive vaginal haemorrhage. The rumours, although not verified, as no autopsy was carried out, was that the massive amount of blood expelled from her was caused by Edith Thompson being pregnant at the time of her execution. As a result of this incident, as expected in a civilised world, all women who were hanged after that were ordered to wear a special canvas garment as a precaution, so as not to repeat the situation that occurred to Thompson. John Ellis, so horrified by what he witnessed, resigned the following year. Not before he had executed another eleven people, including another woman. Traumatised, John Ellis started drinking. A lot. A very lot. He attempted suicide in 1924 by shooting himself in the face. All he managed to do, though, was blow his jaw off. As suicide was illegal at the time, he was arrested, charged, and sentenced to 12 months in prison. Fast forward eight years, and Ellis started drinking again. He wouldn't make the same mistake twice. Instead of a gun to his face, he slit his throat with a razor. Click here to read some Fun History Facts for October 4th.